Summer is coming to an end and that means your kids will be heading off to school very soon! For most parents, this is an exciting and busy time between shopping for all of your school supplies, getting haircuts for school photos, and making sure everything is in order. For our family, it’s extra special as it is our very FIRST Back to School ever! Our oldest son starts Kindergarten this year and we are all so excited for him! I’m finally going to jump on the meal planning train with recipes ready to go each week and to start out, I want to find a few that are fun and easy. 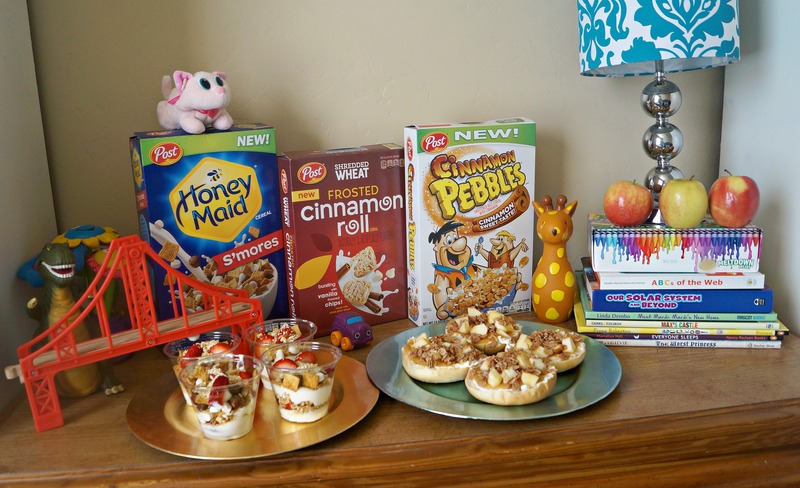 I’ve put together two super fun, easy, and YUMMY recipes you can make for your kids that would be perfect for breakfast or an after school snack! First, I’m going to share with you a recipe we love for breakfast: Apple Cinnamon Pizza Bagels. (My husband LOVES these also!) Then, I’ll show you how to make a fun after school treat: Cinnamon, Strawberry, S’Mores Parfaits! (That’s like all of my favorites mixed into one yummy treat!) What’s great about these recipes is the whole family can enjoy them and you can make them anytime. They also don’t take a lot of ingredients or time, so they work perfectly with a busy back to school schedule! Open up your bagel and spread your whipped cream cheese on both sides. Then, using a spoon, drizzle some applesauce on top and spread it around so it covered just like pizza sauce. 2. Next, add diced apple chunks. Finally, top with sprinkles of Cinnamon PEBBLES™! This recipe is so easy that any mom can do it! And it’s so yummy your kids will LOVE it, and you will, too! Note: I did not toast the bagels first because the Cinnamon PEBBLES™ add the perfect amount of crunch! Pour some of your Shredded Wheat Frosted Cinnamon Roll cereal into a plastic bag and crunch it up into little crumbs. Add a large spoonful of yogurt inside each of the plastic cups. Be sure it covers the bottom of the cup entirely. Then, place a layer of freshly cut strawberries. On top of the strawberries, add a layer of Shredded Wheat Frosted Cinnamon Roll cereal crumbs. Add another layer of yogurt. Add a big layer of HONEY MAID® S’mores cereal. Top with a spoonful of yogurt, a couple pieces of strawberries, and some Shredded Wheat Frosted Cinnamon Roll cereal crumbs. Your kids (and you) will LOVE these! You can also make them ahead and store them in the refrigerator. Mom tip: After school snacks are best when shared with friends! Want to make your own back to school recipes? Earn $1 cash back when you purchase Post Shredded Wheat cereals at Walmart with this ibotta offer. Follow Post cereals on Pinterest for more great recipe ideas!